Data & Digital Strategy Leader. Entrepreneur. Speaker. 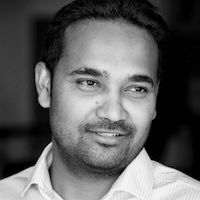 Ravi is a data and digital strategy leader, and good governance advocate. He works at the World Bank in Washington. There, he leads a digital strategy team at the Governance Global Practice and helps to build capacity for evidence-based policymaking in Nepal. He also volunteers with Code for Nepal, the non-profit he founded with his wife. Via the nonprofit, he is opening up Nepal’s data to make it easily accessible, and building civic technology tools to increase citizen engagement and transparency. He is also providing scholarships to help youth in Nepal become digitally savvy. Ravi often speaks at universities and conferences. The New York Times, NBC, and BuzzFeed have featured his work. Ravi is a member of Asia Society's 2018 Class of Asia 21 Young Leaders. He serves on Buena Vista University’s President’s Advisory Council. In 2017, Forbes recognized him as a 30 Under 30's social entrepreneur in Asia. He served as a Penn Kemble Fellow at the National Endowment for Democracy from 2014-2015. In 2009, he co-founded Grassroot Movement in Nepal, a non-profit that has rebuilt more than 30 schools and provided income-generating skills training to women in rural Nepal. The Aspen Institute named his TIME op-ed about using data to deliver aid in Nepal as one of the five best ideas of the day. He has also published in the Huffington Post, and World Economic Forum. He holds a Master of Science degree from Columbia University. He has a Bachelor of Arts degree from Buena Vista University. Connect with him on Twitter @ravinepal.